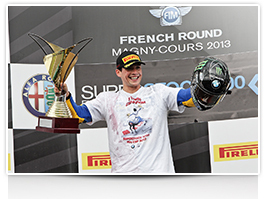 Kawasaki Racing Team’s rider moved closer to the title by winning both SBK races, while world titles in Supersport and Superstock 1000 by the Yamaha of the Yakhnich Motorsport team and by the BMW of the BMW Motorrad GoldBet STK respectively, with both running on Pirelli Diablo Supercorsa tyres The weekend just ended at the French track of Magny-Cours was a penultimate round of the eni FIM Superbike World Championship to be remembered by Pirelli that with the standard Diablo Superbike in soft compound the of the lap record was set by Tom Sykes (Kawasaki Racing Team), who won both Superbike races and the Pirelli Best Lap Awards putting a strong claim to the world title. 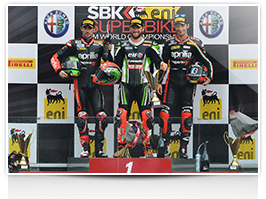 With their bikes fitted with Diablo Supercorsa tyres, Sam Lowes and Sylvain Barrier won - with a race in hand - the FIM Supersport World Championship (for Lowes) and the Superstock 1000 FIM Cup, giving a large number of spectators many strong emotions to enjoy. The weekend was certainly not easy from the meteorological point of view because of the rain that characterized Friday and Saturday and because of the low temperatures, certainly less than ideal conditions for racing and also for the tyres. 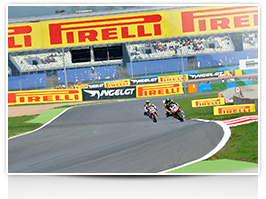 Although they could not exhaustively try the slick solutions in the days preceding Sunday’s races, Superbike riders have almost unanimously opted for the soft standard tyre at the rear, a solution that has been designed to be used with quite high temperatures but already this year has adapted well to rather low temperatures. Until last year the riders would have been forced to use tyres in medium SC1 compound, if not in hard SC2 compound in these conditions, at the expense of grip and better performances. Thanks to the new 17-inch Pirelli Diablo Superbike rear tyres Pirelli has been able to develop for 2013 a high-performance standard tyre in soft compound and at the same time make it versatile to work well with a wide range of temperatures, from very high to those close to 15 degrees registered today at Magny-Cours. And it is also thanks to these tyres that Tom Sykes, first in Race 1 with a time of 1'38.345 and then in Race 2 with that of 1'37.932, managed to break the lap record of a track that belonged to Noriyuki Haga since 2009, with the time of 1'38 .619, improving it by around 0.7 seconds. The Englishman from the Kawasaki Racing Team has certainly not been satisfied over the weekend, recording also a splendid double while Aprilia Racing Team riders Sylvain Guintoli and Eugene Laverty took turns on the second and third step of the podium in Race 1 and Race 2 allowing Aprilia to remain in the lead of the Constructors Championship with a 35 point advantage over Kawasaki. 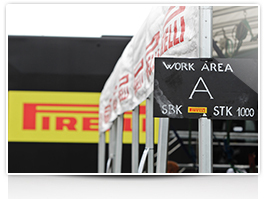 The Pirelli solutions chosen by the riders: The penultimate round of the eni FIM Superbike World Championship has been characterized throughout the weekend by quite low temperatures with rain on Friday and Saturday. For this reason, the riders were not able to try a lot the slick solutions available to them in the days before the races. Despite the unknown weather and not exactly mild temperatures, on Sunday no one had any doubts and virtually all Superbike riders have decided to use the standard soft rear tyre, the Diablo Superbike SC0, which in theory was designed to work best when the temperatures are quite high. 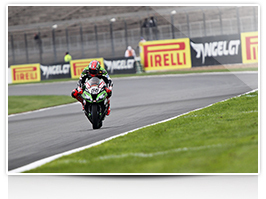 At Magny-Cours has surprised everyone by giving brilliant performances with less than 20 degrees of asphalt and making Tom Sykes reach the track best record. Regarding the front riders’ preferences were more or less equally divided between the standard SC1 and SC2 and the development SC1 development (S283) with approximately half of the grid which has opted for the latter solution. 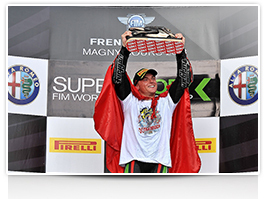 The Diablo Supercorsa was the tyre that led to victory for Sam Lowes and Sylvain Barrier in their respective championships. 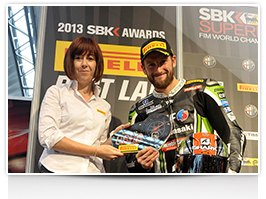 Pirelli Best Lap Award: The “Pirelli Best Lap Award” is awarded by Pirelli to the rider who sets the fastest race lap. This recognition is presented by a Pirelli representative during the Paddock Show in a press conference which follows the podium at the end of races 1 and 2 for the Superbike class and at the end of the Supersport race, for a total of three awards each weekend. The time set by the fastest rider is indicated and can be seen in the trophy which is in the shape of a motorcycle instrument panel this year. 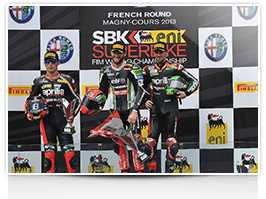 At Magny-Cours the awards were presented by Pirelli Moto France representatives, the Marketing Manager Maryline Lesoeur, the Racing Manager Pascal Serra, Racing and Stefano De Luca, Sales Agents Manager. The Superbike and Supersport rider who has earned the most “Pirelli Best Lap Award” titles at the end of the season will be elected “Best Lap Winner: fastest rider of the year” and awarded in the usual end of year ceremony. 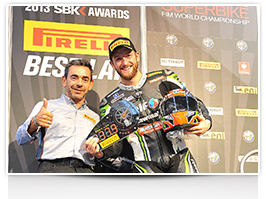 Tom Sykes, having already won 12 Pirelli Best Lap Awards, and Sam Lowes, with 6, are mathematically the “Best Lap Winner: fastest rider of the year” in 2013 for the Superbike and Supersport classes and will be awarded at Jerez de la Frontera in the end of year ceremony. 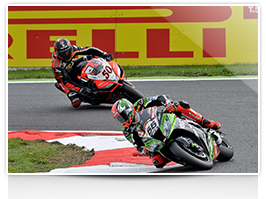 These are the riders who won the Pirelli Best Lap Awards in the penultimate round of the season: WSB Race 1 – Tom Sykes (Kawasaki Racing Team), 1'38.345 (4th lap) WSB Race 2 – Tom Sykes (Kawasaki Racing Team), 1'37.932 (4th lap) WSS – Sam Lowes (Yakhnich Motorsport), 1’41.690 (6th lap) The overall standings after thirteen rounds are as follows: WSB: Tom Sykes (Kawasaki Racing Team): 12; Eugene Laverty (Aprilia Racing Team): 4; Chaz Davies (BMW Motorrad GoldBet SBK): 3; Sylvain Guintoli (Aprilia Racing Team): 2 ; Michel Fabrizio (Red Devils Roma): 1; Marco Melandri (BMW Motorrad GoldBet SBK): 1; Jonathan Rea (Pata Honda World Superbike) : 1; Davide Giugliano (Althea Racing): 1 WSS: Sam Lowes (Yakhnich Motorsport): 6; Kenan Sofuoglu (MAHI Racing Team India): 3; Fabien Foret (MAHI Racing Team India): 1; Lorenzo Zanetti (Pata Honda World Supersport): 1 Comment from Giorgio Barbier, Pirelli Moto Racing Director: "First of all I want to congratulate the two new World Champions, Sam Lowes and Sylvain Barrier, and their respective teams. Sam this year has proven to be really a very strong rider having shown consistent performances, especially if you consider the fact that he had not an easy rival, Kenan Sofuoglu. Until the last he for sure made Sam’s life difficult, so congratulations also to him. As for the Superstock 1000 FIM Cup also Sylvain Barrier, winning five of the nine races done this year, has undoubtedly fully deserved the title for the second consecutive year and the BMW has proven to be probably the best stock motorcycle of the moment having won - in the last four years - three titles. Regarding tyres used this weekend, the Diablo Superbike, in standard SC0 compound, never ceases to amaze and give us great satisfaction. For this weekend the unknowns about temperature were strong and in the days before racing the weather has always been bad. It rained often so both we and the riders arrived to Sunday without ever seeing in action the solution used in the races, except in the warm-up this morning. We knew that this solution could work well with not particularly high temperatures, which are the ones that most suit it, but we did not think it could behave so well even with less than 20 degrees. For us this was a pleasant surprise, we're really happy with the level in terms of performances and versatility that we have achieved with this tyre. The record of the track, the one made by Haga in 2009, got lowered by almost a second by Tom Sykes. That was the cherry on top and the confirmation of what I have just said. This year Kawasaki and Tom Sykes showed that they could do great things and with this round they have effectively mortgaged the title, but obviously it’s better to wait the final round because the WSBK Championship is no stranger to last-minute surprises. Well done also to Sylvain and Eugene who really had a good battle in Race 2". 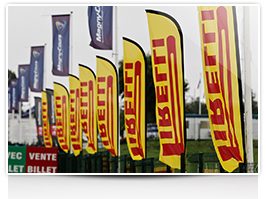 The 2013 Pirelli statistics for Magny-Cours round: • Total number of tyres Pirelli brought: 4352 • Number of solutions (dry, intermediate and wet) for the Superbike class: 5 front and 6 rear • Number of tyres available for each Superbike rider: 32 front and 34 rear • Number of solutions (dry, intermediate and wet) for the Supersport class: 4 front and 5 rear • Number of tyres available for each Supersport rider: 23 front and 26 rear • Temperature in Race 1: air 16° C, asphalt 17° C • Temperature in Race 2: air 17° C, asphalt 21° C • Maximum race speed reached by Pirelli Diablo Superbike tyres: 295.9 km/h, in Race 1 by Eugene Laverty (Aprilia Racing Team) at 11th lap • Maximum race speed reached by Pirelli Diablo Supercorsa tyres in Supersport: 268.7 km/h, Kenan Sofuoglu (MAHI Racing Team India), 11th lap.